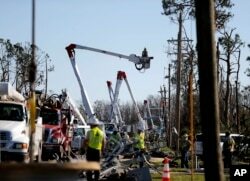 U.S. President Donald Trump praised Florida governor Rick Scott for his efforts in the aftermath of Hurricane Michael during a visit to affected parts of the Florida Panhandle Monday. "The job they've done in Florida has been incredible," Trump said, speaking alongside Scott. "You're a great Governor. You really have been. He steps up in the biggest emergencies, the biggest problems, and he gets it done." U.S. President Donald Trump steps off Air Force One as the president arrives to tour storm damage from Hurricane Michael at Eglin Air Force Base, Florida, Oct. 15, 2018. 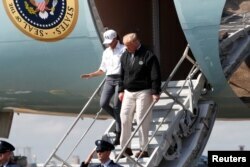 Accompanied by his wife Melania, Trump's trip Monday comes as search and rescue crews continue to look for people still missing after the storm. The President said that electric companies have been "really incredible and responsive" in getting power back to homes that survived last week's devastating hurricane, but noted that many homes were destroyed by the storm. Trump said he will also visit affected areas of the state of Georgia. xMichael came ashore Wednesday as a powerful hurricane with maximum winds of 250 kilometers per hour (155 mph) and high storm surge that combined to knock down buildings, cut off electricity and leave debris strewn across coastal areas. Crews work to restore power in the aftermath of Hurricane Michael in Panama City, Fla., Oct. 13, 2018. At least 17 deaths have been blamed on the storm along its path from Florida to Virginia. Among the hardest hit areas was Mexico Beach, a Florida Panhandle town that Governor Scott said now resembles a war zone. Ahead of the Trumps' visit, Scott toured some of the devastation with Federal Emergency Management Agency chief Brock Long, who said the damage in Mexico Beach is some of the worst he has ever seen. 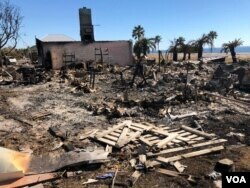 The town's medical manager, Patricia Cantwell, said, "It's extremely sad that the devastation has been so rampant throughout the Panhandle" of the state. "Having lived through Hurricane Andrew in south Florida [in 1992], it's going to take a while," she told VOA. "It's one day at a time. It looks overwhelming to start, but, you know, one day at a time. It's going to take years to get things back up and running." President Trump told the CBS news show 60 Minutes in an interview broadcast Sunday that he does not know if global waning is manmade, despite the scientific research showing that pollution and human activity is the major contributor. He said he does not want to give "trillions and trillions of dollars" and lose "millions and millions of jobs" to prevent it. Most scientists link a warming planet with storms that are more intense. Hurricane Michael slammed into the Florida Panhandle last week as the strongest storm to strike the continental United States in nearly 50 years. Trump said there have been hurricanes that were "far worse" than Michael and said scientists calling for action on climate change have a "very big political agenda." The president has over the years called global warming a hoax and had once called it a Chinese plot aimed at wrecking the U.S. economy. "I think something's happening. Something's changing and it'll change back again," Trump told CBS. "I don't think it's a hoax, I think there's probably a difference. But I don't know that it's manmade."